Book and pay here for 10th anniversary Cleanpower Smart Grids 2019 sponsored by tech leaders Darktrace and CyanConnode. Tickets in 2019 are cheaper than 2 years ago! Don’t miss this timely 10th birthday on Grand Challenges for Clean Growth via AI & data and connectivity. I pay by bank transfer. Please contact CIR Ltd at 00441223303500 or see bank information in the e-invoice generated after hit submit. I pay by cheque. Please call CIR at 00441223303500 for postal address or see info in autoinvoice sent after hit submit. Thank you for your booking. Please note that we allocate event delegate places on a first-come, first-served basis and places are limited and on advance 14-day booking. Dinner also requires 7-day advanced booking. We'll send you confirmation of this registration by email. Please use form to see pricing info for all options - early bird discounts are built into the form & prices go up over time. You will not send any data until you hit submit button. By booking here, you accept that from 24 hours after submission bookings may be substituted but not refunded and that payment is due unless non-attendance has been positively communicated with the organisers within the 24 hours. We have a no-quibble return policy if you or your substitute are not satisfied with the value of the event after attending. This is the home of the unique 10th Cleanpower & Smart Grids Conference Summit 2019 (#CPSG19) event series. The series brings together technology inventors with commercial innovators, investors and the business network. The 2-day conference summit this year addresses the Grand Challenges of Clean Growth enabled by machine learning, AI & data, cybersecurity, connectivity, clean energy and storage. What is the vision? What are the risks? What technical issues of deployment exist and how challenging are they? What new business models will be used? We will present and facilitate open discussion. We aim for collective brilliance through open talks. We warmly welcome you to join us in Cambridge, UK this summer 2019, to help solve Grand Challenges around Clean Growth enabled by AI & data, machine learning and digital connectivity and energy technologies. This approach aligns both with private sector technology inventors and commercialising innovators and the UK and other governments. Join us to update, discuss, understand, network, dine, meet, build relationships and invest or fund your business. Cleanpower & Smart Grids is part of CIR’s network of exchange (C4IR) and global event series. We offer valuable support and market access to those interested in understanding and investing in industry 4.0 technologies and business models. With complexity and (cyber and investment) risk high, new business models unfamiliar, ROI and market timing unclear, technology implementation challenging, yet investment urgency very high, the C4IR investment network and event series is a much needed, bold initiative to connect, understand and move forward. I hope this will be of value to corporates, financial investors, entrepreneurs at growth companies listed or privately held, engineers, inventors and innovators. 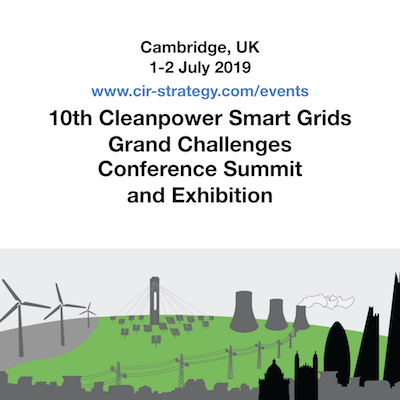 Welcome to this 10th anniversary Cleanpower Smart Grids Conference 2019! 1 July 2019 Welcome reception, executive briefing day, dinner evening at King’s College & networking 10:00am - 9:00pm. For excellent enhanced networking exhibition stand positions width 3m, priced at £2k, please call Maya on +447720047402 to secure! 3. Investment strategy and risk for corporate and scaling businesses. The forums begin with an executive briefing technology day followed by the dinner networking evening then the following morning is the commercial innovation conference summit and showcase; the programme is designed for very busy senior executives, shorter and more flexible and intense than many events but with enough time for networking and relationship-building. All London Airports (Stansted STN (30 mins, exec taxi transfer cost £GBP50), City LCY (2h, £GBP125) , Heathrow LHR (2h, £GBP150), Luton LUT (1h30, £GBP100), Gatwick LGW 3h, £GBP200) serve Cambridge. Taxis take 10 minutes from the Cambridge train station and cost under £GBP 10. CIR invites you to its high-quality events. Experienced leaders run the sessions. You gain knowledge and networking value. Develop your fund, business or corporate success through insights and by growing the depth and quality of your network. CIR founded its network in 2002, since when there have been 50 great conference days for 4,250 participants, including 500 speakers covering high value manufacturing and automation, industrial sectors, new materials such as digital connectivity in energy, clean power, transport, homes and health, smart systems, IOT, graphenes and functional materials and machine intelligence. We are well-placed to deliver this global platform for business and are excited by the journey into the future.